Universal skates WORKER Nolan 2in1 with blades of certified steel replaceable for aluminum frame for in-line. Thanks to the patented system of quick size readjustment are WORKER Nolan skates one of the most versatile skates 2in1. The inner boot with Comfort Fit system. Safety Ankle Technology firmly holds the ankle in the correct position. 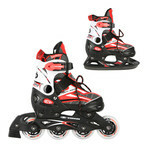 Easy to put on, lacing and a double safety clasp MicroLock ensure comfortable use of these skates. Another important advantage is removable brake on the right skate and quality ABEC 5 Carbon bearings. Frame is the main art of every skate. Ice skates are designed to with stand low temperatures and potential puck hits. That's why most of them feature durable plastic frame. Most adjustable 2in1 skates are also made of plastic. Aluminium ensures durability, speed and light weight. 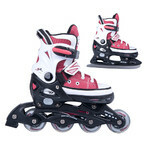 Aluminium frames are found mostly in summer inline skates. Ice skate blades differ mainly in the design of the front part of the blade. Blades with toe picks can be seen especially on women's skates. They allow for a figure-skating style, where the skater can use the toe picks to stop their movement. Blades without toe picks are typical for men's types of skates. 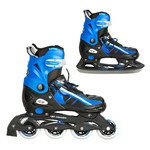 They are suitable for a fast hockey-style skating. Thanks to the high-quality stainless steel, the blades are corrosion resistant. The ABEC-1 through ABEC-9 scale denotes the presision of the manufacture process. The higher the number, the more precisely the bearings are made (smaller margin). Other scales are used mainly on children's skates. Wheel hardness between 76A and 90A is ideal for casual skating. Wheel hardness over 90A is better suitable for speed and race skating. 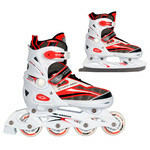 Type of fastening depends on the purpose of your skates. Men's and women's ice skates are fastened by laces which are perfect for tightening the skate around your foot when ice skating. 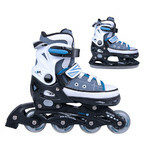 Inline skates usually feature a combination of lacing and buckles or Velcro straps. The laces comfortably adjust your foot on the shoe and the straps and bucles will secure your ankle. 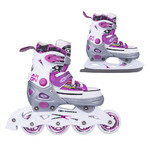 Both ice and inline children's skates, are mostly secured with buckles. They are easy to use and very popular among children. They are suitable for all children that lack the strength to tighten laces or those who can't yet tie them. 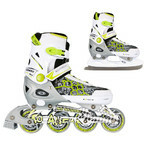 How to Choose the Correct Size and Type of Inline Skates? How to Choose Children's Skates? 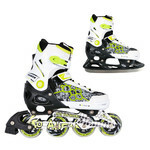 How to Choose Inline Skates?